Photo courtesy of zimbio.com. 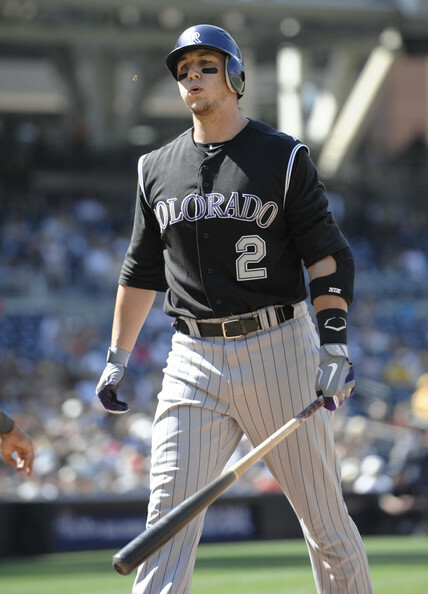 Last year at this time, it appeared Troy Tulowitzki (pictured above) was in for a monster season. It didn't happen. This year, he is off to an awful start. What will be the result? Welcome to the 14th edition of “Throwback Saturdays.” This is a day to look back and reflect. A day to see just how wrong or how right I was with my analysis and projections. What was happening on April 21, 2011? How about April 21, 2010? Let’s find out. Many guys look to be on their way to career seasons. There are two in particular that really stand out to me that are worth being noted. Troy Tulowitzki, the fifth year shortstop for the Colorado Rockies appears to be on his way to an MVP caliber season. Granted there are still over five months to play, but it is safe to say that this guy has begun to really realize his potential. Currently Tulo, as many call the Colorado shortstop, is batting .343, has 7 HRs, and 14 RBIs. This places him at 12th in the NL in batting average, 1st in HRs, and 4th in RBIs. Not to mention the guy has been throwing some serious leather at shortstop. Many have felt this guy was destined to be a perennial All Star that could bring home an MVP Award at some point. Well that time appears to be now. Keep an eye on the Rockie’s star, who currently has led his squad to the best record in all of baseball up to this point. Kendrick is another fifth year player like Tulowitzki who has had a lot of hype up until this point in his career. Many have expected big things, and the guy has yet to really consistently deliver over the course of an entire season. Well this year, the inconsistency and growing pains appear to have come to a close. Currently, the Angel’s 2B is batting .288, has 5 HRs, and 8 RBIs. Kendrick has never hit more than 10 HRS or drove in more than 75 RBIs during a season up to this point in his career. He is on pace to end up with 45 HRs this year. Keep a close eye on Kendrick, who looks to be on his way to the first monster season of his career (To finish reading this post, click this link). Monster seasons? They didn’t happen. Both Tulowitzki and Kendrick had very solid years. A case could be made that 2011 was the best year of both of their careers. But they were just slightly better than prior years. Each guy dealt with injuries sidelining them for 20 games apiece. Tulo did end up making the All-Star Game and bringing home a second consecutive Gold Glove. He also finished eighth in the NL MVP voting, which was very respectable. Tulowitzki’s Rockies finished a mind-boggling 16 games under 500. So they did not possess the best record in baseball for much longer. Kendrick on the other hand did not hit 45 home runs. He actually hit less than half that number 18 (still a career high). Also, Kendrick came up short of driving in 75 runs (drove in 63). So I was right in that both players had career years. But I was wrong in saying that they would have monster seasons. Say it ain’t so Edinson! But the real big news of the day dealt with the MLB. And it did not have to do with a walk off home run or a 20 inning game, but the juice. Edinson Volquez, the young and very talented Cincinnati Red pitcher tested positive for performance enhancing drugs. Edinson is the first player in the League to be suspended on the Major League drug program since Manny Ramirez last May. Volquez is in the process of recovering from Tommy John surgery and was not expected to be back until at least July or August. Well now, he is technically suspended 50 games. Interestingly enough, his 50 game suspension will be taken while he is in the rehab process anyways. So he will not have to miss any games that he was actually going to be able to play in. Now many would say, what kind of punishment is this then? Well I mean the guy is still losing a third of his entire year salary. The guy does make 445,000 a year, which is not much by Major League baseball standards, but still a hefty salary for the typical American. And now he will forfeit a third of that. So even though he still will make more money this year than most Americans, how would you like to lose a third of your yearly salary? Secondly, his name is now forever tarnished. Regardless of the excuses he makes, he will always be known as a guy who used performing enhancing drugs. Another one of the juicers. This is a shame for a guy with so much potential and ability (To finish reading this post, click this link). Not only is his name tarnished, but his game is tarnished as well. Since an amazing first half of the season in 2008 in which he went 12 and 3, Edinson has gone an extremely mediocre 18 and 16. In addition, his ERA during this stretch has been around 4.75. Not exactly impressive for a former All-Star. Steroids have no place in baseball. Edinson should have admitted to what his “actual” use of the performance enhancing drugs were. He didn’t. Since his use was made public, Edinson has gone 9 and 11. Karma hurts. This entry was posted in Miscellaneous and tagged All Star, Cincinnati Reds, Colorado Rockies, Edinson Volquez, Howie Kendrick, Los Angeles Angels, Manny Ramirez, MLB, MVP, steroids, Troy Tulowitzki. Bookmark the permalink.